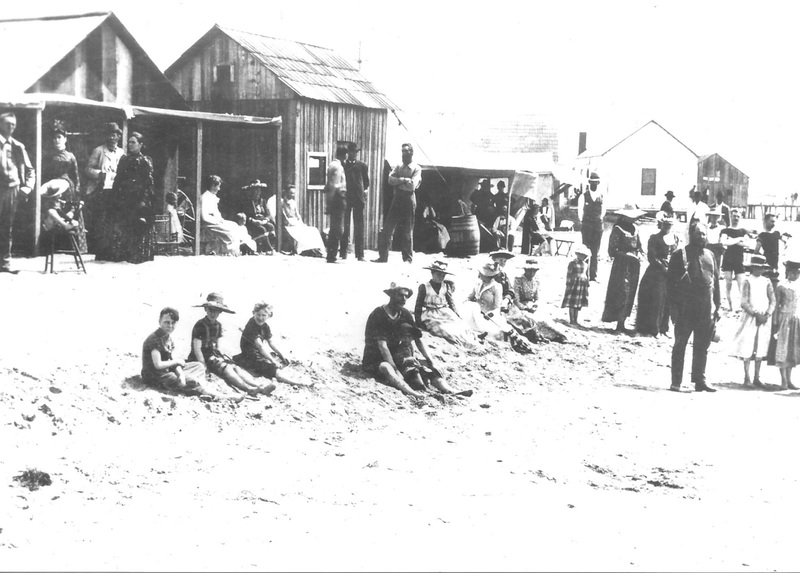 In 1857, as lumber was unloaded at Anaheim Landing to help build the town of Anaheim twelve miles inland, seals and sea lions perched on a sandy shoal watching the activities. An arm of the sea reached eight miles inland supporting a channel deep enough to float a barge and allow ships to unload their cargoes. A small community grew up around Anaheim Landing, the port for the Santa Ana Valley, but real growth came later. 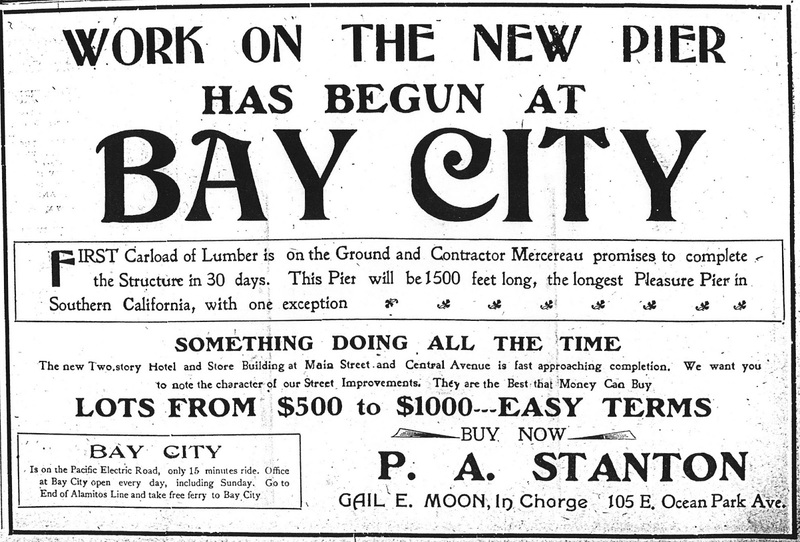 At the beginning of the 20th century a new community, christened Bay City because of its location between Alamitos and Anaheim bays, sprang up next to Anaheim Landing due to the efforts of John C. Ord. 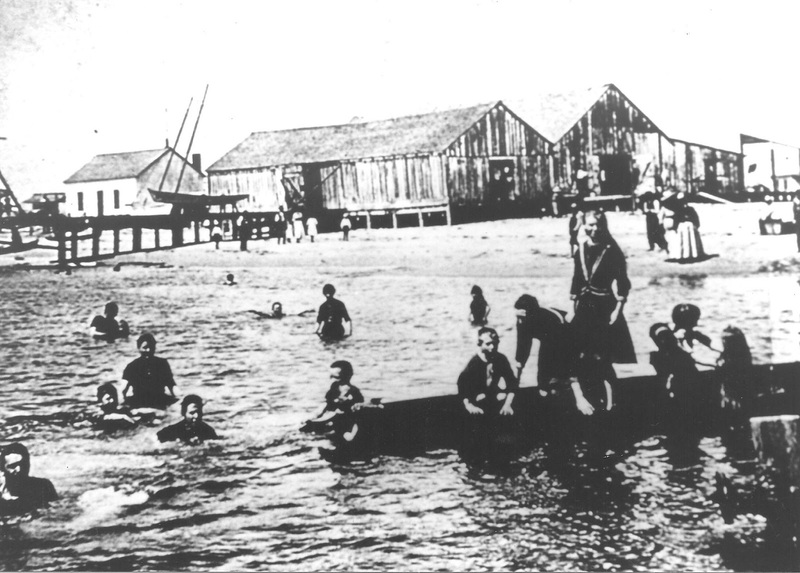 In 1901, Ord hired a thirty-mule team and moved his general store from the town of Los Alamitos to the eastern edge of Alamitos Bay. He set up shop at the southwest corner of a crossroads now known as Main Street and Electric Avenue to serve the fishermen and residents of Anaheim Landing. wide streets, a water system, gas, electric lights and sewers were in place. 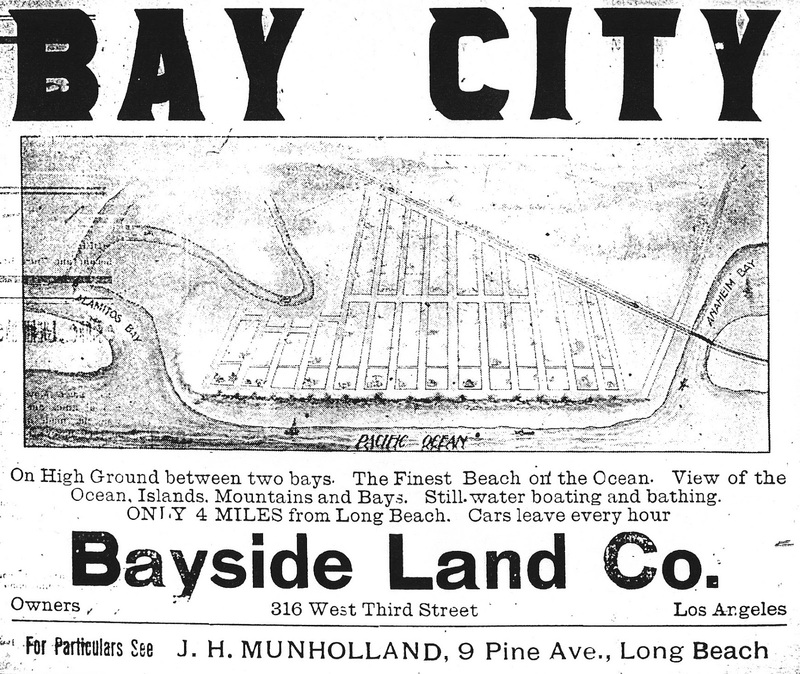 An eighty-foot wide boulevard known as Ocean Avenue extended from the water’s edge east for about a mile where it made a graceful curve terminating near the bath house, bowling alley and restaurant built by the Bayside Land Company at Anaheim Landing. 1907, a result of the 1906 San Francisco earthquake. In 1913 economic conditions improved and it appeared that a land boom was eminent when word was received that another line of the Pacific Electric (P.E.) would be passing through the town, thanks to the growth of neighboring Long Beach. In the 1910 U.S. Census Long Beach had gained the reputation as the fastest growing city in the United States. The population had risen from 2,252 in 1900 to 17,809 in 1910. 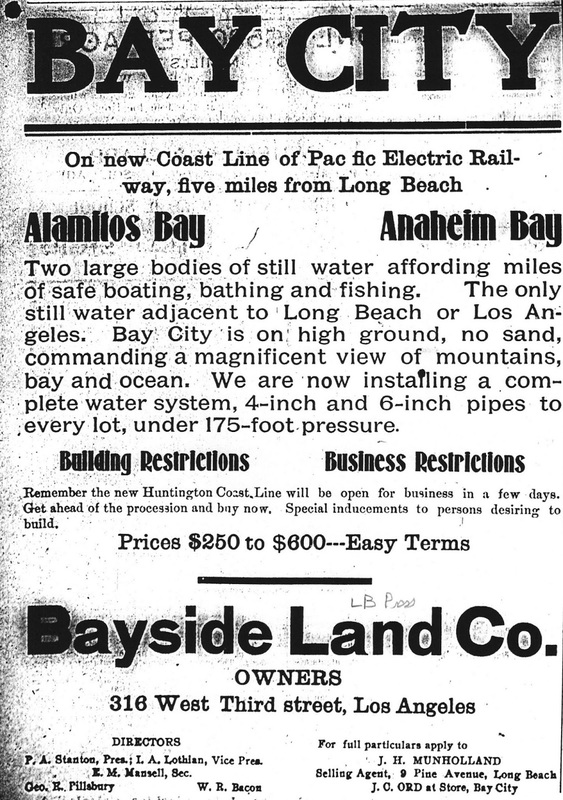 Much of this increase was precipitated by Long Beach's new Pacific Electric transit system (which had linked the city with Los Angeles in 1902), and the development of the harbor. Now, in 1913, due to the tremendous population growth around Belmont Heights, the P.E. line from downtown Long Beach split at the Mira Mar station continuing east on Ocean Blvd. out to the Alamitos Bay Peninsula and into Bay City. There the new Long Beach-Alamitos Bay-Seal Beach line merged with the original Newport-Balboa line on the way down the coast to Huntington and Newport Beach. The time was right for the Bayside Land Company to gear up for more land sales. However, real estate competition was tough. Land promotion was also taking place in Big Pines, Hermosa Beach, dairy ranches in Antelope Valley, Santa Monica Canyon, North Lankershim, the Del Mar tract by Venice, Cudahy City and the harbor area of Long Beach. The enterprising real estate dealers needed something to catch the attention of buyers. 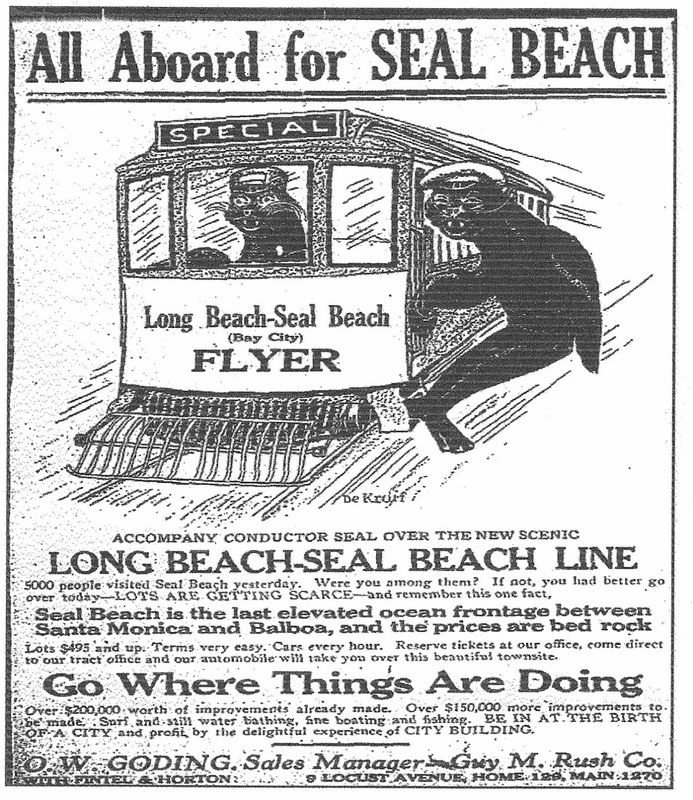 They decided to turn sales over to the Guy M. Rush Company of Los Angeles whose intensive advertising campaign promoted the seals that lived on the sand spit at the mouth of Alamitos Bay. 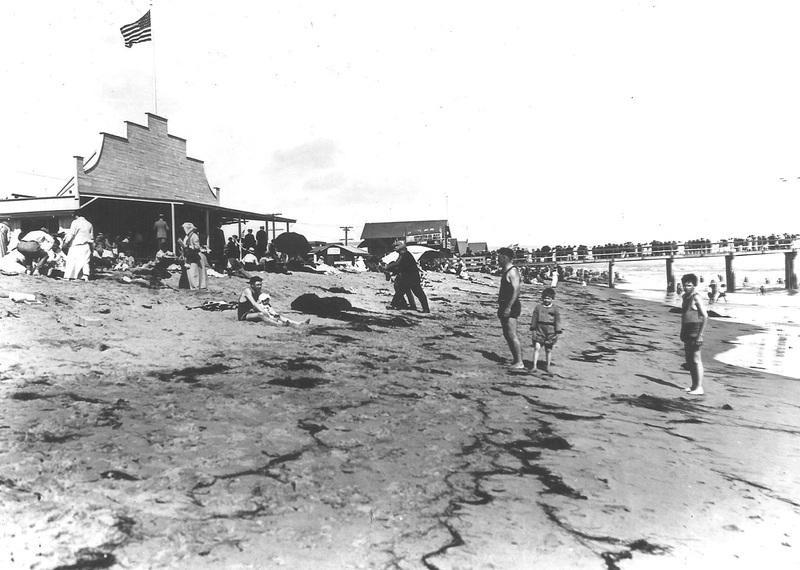 In July 1913, when advertising began, the name of the town was changed to Seal Beach. Eye-catching illustrations of seals drew attention to this new community. Advertisements first appeared in local newspapers on July 9, 1913, and continued until October 17, 1914. Henri (also spelled Henry) Gilbert DeKruif was the artist who drew the delightful seal illustrations you'll be viewing in the proceeding posts. Born in Grand Rapids, Michigan, on February 17, 1882, DeKruif trained at the Art Institute of Chicago, Art Students League in New York, attended Hope College in Michigan and worked at Grand Rapids Advertising Company. In 1911 DeKruif moved to Los Angeles where he continued working as a commercial artist with the Merril Advertising Company. It was while he was employed with this company that he was asked to take on the Seal Beach advertising campaign. Later DeKruif joined the Laguna Beach art colony and was known for his watercolors, etchings and lithographs. He was twice president of the California Watercolor Society. His works can be found at the Los Angeles County Museum of Art, Los Angeles Public Library, San Diego Museum of Art and the Library of Congress. He died at his home in Los Angeles July 6, 1944. DeKruif’s talent was aptly described in Touring Topics in March 1929: “With the eyes of the poet and the ears of the musical composer attuned to its extraordinary manifestations, Henri DeKruif has found and interpreted a certain spirit…” I think you’ll agree. The ads for Seal Beach, drawn by Henri Gilbert DeKruif, are presented here in this post for you to savor, along with articles of the day describing the new community. Enjoy.